Social Media is already declared as a ‘sharp-edged weapon’ in Tunisia’s revolution and now it has spread its wings across Egypt. The scary anti-Mubarak campaign in Egypt is yet another example of people’s movement. It was too late for Mr. Mubarak to invade with a ban on social media in Egypt. The fire via FB, twitter, YouTube etc had already engulfed the whole country. China has already banned social media and has virtually 'deleted 'Egypt' to avert such a situation while other GCC countries are getting jitters and anxious. Mubarak, in an attempt to extinguish the rapid burning fire, took first steps to ban Internet that further created furor among people. The worldwide administration can put restrictions on Print, Radio and television but any attempt to ban social media or internet provokes and creates reactive and retaliatory actions, for social media is a ‘media of people’. Banning a social media implicitly means ‘boycotting people’. 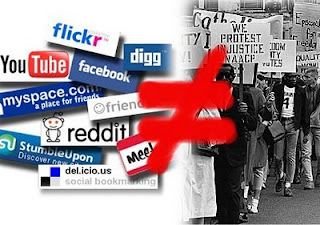 The inherent democratic traits of social media can’t be subdued nor can be censored. History has witnessed very strong role of print, radio and television media in civil wars, revolutions, and even World Wars. Time is gone now when media could have been controlled and censored. Now the power of vox populi is already shifted from elite media to public media. The worldwide administrations are really cautious to ban people’s media to avoid Egypt-like consequences. China has taken a daring step to temporarily diffuse the ‘hot balloons’ after Egypt’s revolution by banning the social media but the very country knows that it’s not the permanent solutions. Social media is emerging as a ‘lethal weapon’ more than any other media channels. It’s because of its ‘connectivity’ and ‘WOM’ characteristics. No other media is a two-way communication other than social media. Einstein created nuclear with a sole purpose of human welfare but its wrong usage brought holocaust. Many worldwide administrations like Tunisia, China, Egypt, Arabian nations deem ‘social media’ as a lethal tool and consider them even more dangerous than a nuclear weapon but what they are not realizing is that their attempt to ban social media fuels the rapid fire to engulf the whole countries. They should realize that no administration is bigger than 'WE THE PEOPLE'. It’s not a question of sovereignty but a question of democracy. Restriction on social media to safeguard sovereignty is justifiable but it’s not justifiable to censor social media for a social movement which I believe is above democracy. Would love to take a line or two to quote on my blogs, assignments or talks. Kindly permit. Thanks!